flabdablet's tips for teaching stick. On BGS ("Big Green Sign" - yes that *is* actually the technical term for them) assemblies, usually the letters are made of reflective metal that is riveted onto the reflective green background. ... 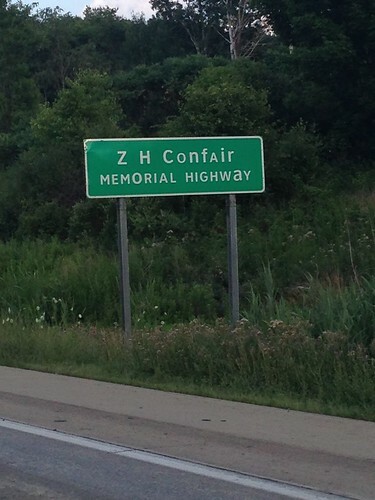 I'm guessing PennDOT Region Whatever awarded a contract to some company to fix this sign to replace letters which may have fallen off due to premature rivet failure or other reasons. And PennDOT is NOTORIOUS in the roadgeek world for being CHEAP. Likely, they awarded the contract to the lowest bidder, who subsequently paid no attention whatsoever to MUTCD regulations and now you have this odd mixed case. Great answer from tckma (and our introduction to the world of roadgeekery) to cortex's question (about a photo by Jessamyn) How do highway signs get (incorrectly) made?, including some wonderful links to AARoads forum threads on "Erroneous Road Signs," "Signs With Design Errors," and "The Worst of Road Signs."